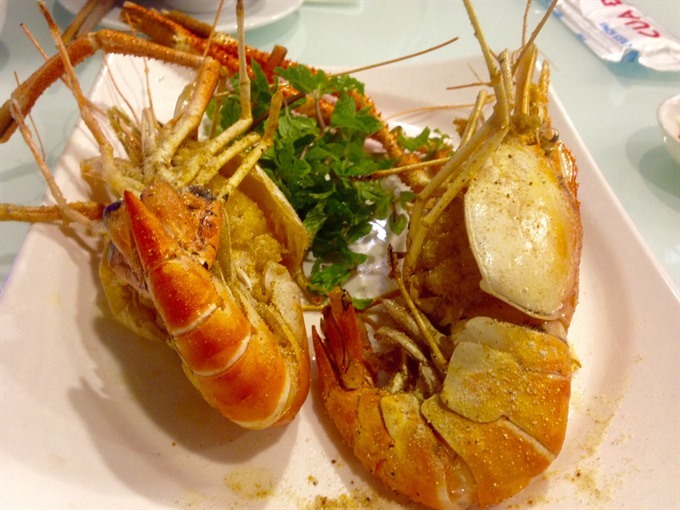 With a wide selection of fresh fish and seafood to choose from, Red Crab in Đà Nẵng is a perfect choice for delicious dishes in the coastal city. Mộc Miên pays visits to the restaurant. Đà Nẵng is known for its abundance of fresh seafood. Visitors to the central city are in store for a unique experience, whether they choose to sample the casual seafood dishes sold along the coast or dine at the upscale restaurants in the city centre. My latest trip to Đà Nẵng in April this year was the most enjoyable out of the 7 times I’ve visited. A restaurant named Red Crab, with its delicious food, left an unforgettable impression on me. The restaurant is situated far from the bustling downtown area, yet was under 100 metres from my hotel. The 2-storey villa is right on the intersection of Nguyễn Văn Thoại Street and the lane along the coast. A wide variety of seafood was on offer, such as lobster, geoduck, snail, scallop, crab, not to mention the many other local fishes. For each kind of seafood, different sizes were arranged separately and signs indicated whether the creatures had been caught in the wild or farm-raised. It was hence easier for customers to make their choices based on price and quality. My friend and I, as two young women, were not heavy eaters. We had already sampled crab, scallops and geoduck the day before at another restaurant, so we chose fish and shrimp at Red Crab. After a visit to all the seafood pools and much consideration, we settled on 2 medium-sized shrimps. 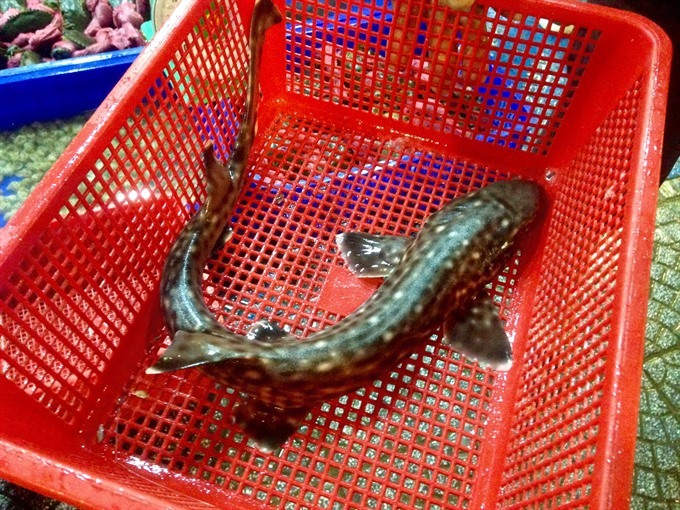 We were especially curious about a fish with a long torso and black spots on its skin that looked pretty scary. “This is a ‘shark’.” The restaurant owner answered, laughing at our surprise. We burst into laughter because the fish could have only weighed about 700 grams, much less than the sharks we were used to seeing on TV. Maybe that was just what the locals called it. Thanks to the restaurant owner’s recommendation, we had grilled shrimps with chilli and lemongrass, as well as the vinegar-dipped ‘shark’. We were escorted to a large air-conditioned dining room and assisted by an attentive waiter. Just 10 minutes after we’d sat down the hot grilled shrimp was served. To our surprise, the shrimps seemed to have grown slightly bigger after being cooked. Despite being termed a grilled dish, the shrimp seemed to have been fried first, so the meat was cooked yet still juicy and tender. This was the first time I’ve ever tried this kind of giant shrimp but I enjoyed every mouthful. The dish had been masterfully prepared by the chef; the shrimps’ heads and tails were kept for the sake of decoration, not to mention their perfectly crispy texture. The meat had been marinated well and was bursting with flavour. The simple dipping sauce of just salt, lime juice and chilli gave the shrimp just the right kick. Both my friend and I relished the flavours and sweetness from every bite. As we were finishing up the grilled shrimps, the fish dish was served. Far more interesting than we imagined, the dish was a combination of a hot pot and fresh rolls. We got 300-400 grams of fillet out of the 700-gram fish. The fillet was skillfully minced into paper-thin pieces, placed on top of wild parsley and onions. The rest of the fish had been put into the hotpot for flavour. The broth was a mix of various local ingredients, such as fried shallots and garlic, minced pineapple, lemongrass, rice vinegar, and the unique green chilli - the signature part of Đà Nẵng’s cuisine. Once dipped into the hotpot, each piece of fish took only 30 seconds to cook, becoming tender but not crumbly. The skin was not fatty and had a tantalising crispiness. Luckily, the dish didn’t smell fishy like many other kinds of saltwater fish. 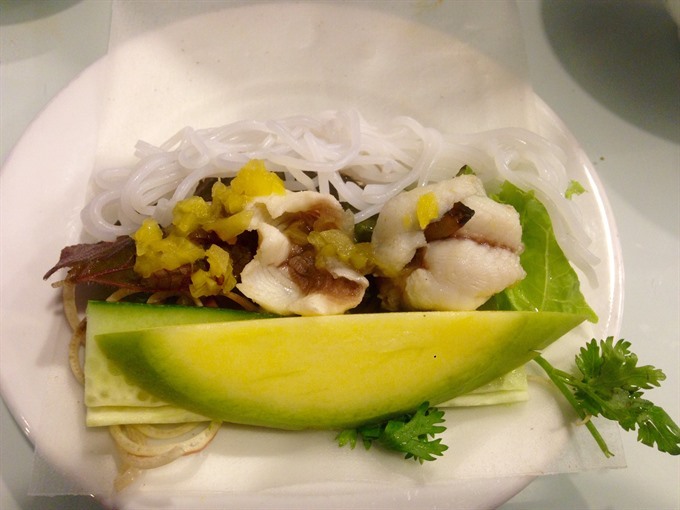 We put some lettuce, perilla, finely slided banana blossom; cilantro, cucumber and unpeeled green mango on a sheet of rice paper, rolled it up and dipped into the famed fish sauce of Đà Nẵng. This was truly a flavour explosion! The roll of fresh fish and vegetables was a perfect match to the fish sauce. To someone who is unfamiliar with the fish sauce, it is as strong and pungent as Hà Nội’s shrimp sauce but once one gets used to it, it becomes an addictive addition to the meal. Even just a piece of green mango was good with the sauce, not to mention a whole roll with delicious fish and a combination of raw herbs. After a few rolls, we tried the fish with the broth in the hotpot. Dipping the fish and then the vegetables into the hotpot, we added some fresh rice noodles. A hot bowl of fish noodle soup washed away all of our stress and gave us renewed energy. The sweet and sour taste of the broth was very palatable. The hotpot had just a right amount of protein with one fish so we felt very relaxed instead of uncomfortably full. With just two exceptional dishes and a couple of beers, we enjoyed the perfect dinner. Red Crab proved to be an excellent choice for two girls watching their weight, but craving some unique and delicious food. 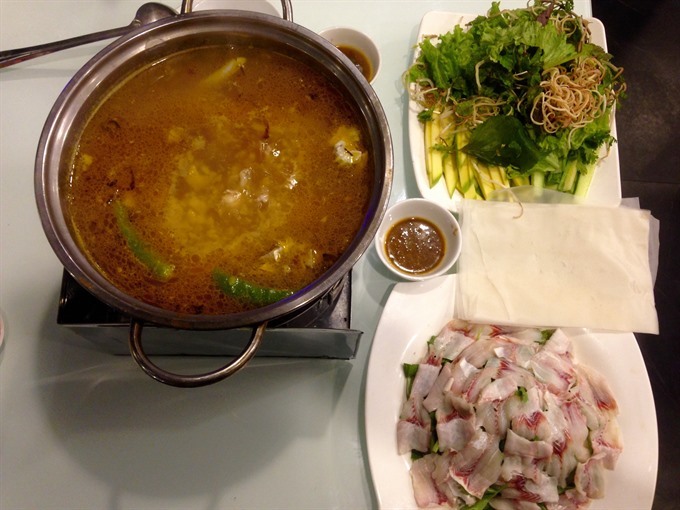 If you find yourself in Đà Nẵng, this spot comes highly recommended for any foodie!